[185 Pages] Antifouling Paints and Coatings Market is projected to grow from USD 5.61 Billion in 2015 to USD 9.22 Billion by 2021, at a CAGR of 8.6% between 2016 and 2021. For company profiles in the report, 2015 has been considered as the base year. In certain cases, wherein information is unavailable for the base year, the years prior to it have been considered. 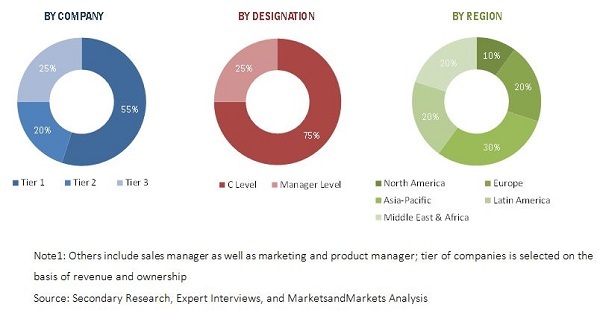 The research methodology used to estimate and forecast the global antifouling paints & coatings market begins with capturing data on key vendor revenues through secondary research. The vendor offerings are also taken into consideration to determine the market segmentation. After arriving at the overall market size, the total market was split into several segments and subsegments, which were later verified through primary research by conducting extensive interviews with key personnel, such as CEOs, VPs, directors, and executives. Data triangulation and market breakdown procedures were employed to complete the overall market engineering process and arrive at the exact statistics for all segments and subsegments of the market. The breakdown of profiles of primaries is depicted in the figure below. The global antifouling paints & coatings market has a diversified ecosystem of upstream players, including raw material suppliers, along with downstream stakeholders, vendors, end users, and government organizations. Companies operating in the global antifouling paints and coatings market include AkzoNobel N.V. (Netherlands), The Sherwin-Williams Company (U.S.), Nippon Paint Marine Coatings Co., Ltd. (Japan), Jotun (Norway), Hempel A/S (Denmark), and Chugoku Marine Paints, Ltd. (Japan), among others. The report provides detailed qualitative and quantitative analysis of the global antifouling paints & coatings market, along with market drivers, restraints, opportunities, and challenges. The top players of this market are profiled in detail, along with recent developments and other strategic industry-related activities. “This study answers several questions for the stakeholders, primarily which market segments to focus in the next two to five years for prioritizing the efforts and investments”. Scope of the Report: This research report categorizes the global antifouling paints & coatings market on the basis of type, application, and region, forecasting revenues as well as analyzing trends in each of the submarkets. Detailed analysis and profiling of additional market players (Upto 5 companies). The global antifouling paints & coatings market is projected to reach USD 9.22 Billion by 2021, at a CAGR of 8.6% between 2016 and 2021. This growth is mainly attributed to the increasing demand of antifouling paints and coatings from the shipping industry and rising concerns toward reduction in fuel consumption. These coatings play a key role to reduce fouling & corrosion, extend the vessel's life & efficiency, reduce operational costs, and avoid marine accidents & expensive repairs. Among all types, the copper-based antifouling paints & coatings segment is the fastest-growing type segment in the market, as these coatings are environment-friendly and as such, are increasingly used in hulls and underwater surfaces of shipping vessels. Moreover, copper-based antifouling paints and coatings ensure fouling-free surfaces of ships or boats, which result in substantial fuel savings and consequently reduce emission of greenhouse gases. The shipping vessels segment accounted for the largest share of the global antifouling paints & coatings market in 2015. Increasing usage of antifouling paints & coatings for protecting vessels from growth of fouling organisms, along with the extension of dry dock intervals is propelling the growth of the global antifouling paints and coatings market. Asia-Pacific accounted for the largest share of the global antifouling paints and coatings market in 2015, and is expected to continue its dominance till 2021. China, South Korea, and Japan led the Asia-Pacific antifouling paints & coatings market in 2015. Among all countries in the Asia-Pacific, this market in China is projected to grow at the highest CAGR between 2016 and 2021. The factors inhibiting the growth of the global antifouling paints & coatings market are volatile raw material prices and government regulations in the paints & coatings industry. Key market players operating in the global antifouling paints and coatings market, such as AkzoNobel N.V. (Netherlands), The Sherwin-Williams Company (U.S.), Nippon Paint Marine Coatings Co., Ltd. (Japan), Jotun (Norway), Hempel A/S (Denmark), and Chugoku Marine Paints, Ltd. (Japan), among others, have adopted various strategies to increase their market shares. 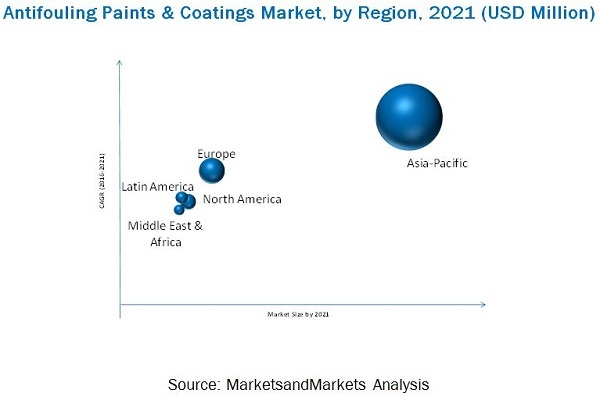 Agreements/contracts/partnerships, new product/technology launches, expansions, acquisitions, and research & development are some of the key strategies adopted by market players to achieve growth in the global antifouling paints and coatings market. 12.4 Nippon Paint Marine Coatings Co. Ltd.
12.9 Chugoku Marine Paints Ltd.